Hillary Clinton sought unsuccessfully to persuade voters to keep Donald Trump and his volatile temperament away from the nuclear launch codes. Now that Trump is about to take the helm, those worries will swell — not just among the experts but probably in the populace at large. WASHINGTON — Since the Cold War ended 25 years ago, Americans haven’t thought much about nuclear war. That changed slightly in the recently concluded presidential campaign, but it needs to change dramatically, many experts say. Unbeknown to most voters, a growing number of security analysts says the risk that nuclear weapons might be used by nations or terrorist groups is increasing, and it may even be higher than it was in the Cold War, due mostly to a spiral of Russian provocations and Western responses. Many of these critics have dusted off decades-old proposals for lessening the risk that America’s nuclear weapons could be used rashly or inadvertently, due to system error, false warning or U.S. sensors or computers compromised by enemy action. For one thing, they say, it is past time to end the requirement that nuclear missiles must be ready to launch within minutes. And, they say, a planned $1 trillion overhaul of America’s nuclear arsenal is excessive. But the critics are in the minority in Congress, and the odds appear slim that their calls will be heeded. Besides, rising tensions, especially between the United States and Russia, make it harder for leaders to unilaterally take actions that could increase stability, for fear they might be perceived as weak. Bilateral or multilateral agreements are possible but hard to complete. Donald Trump’s election brings critics’ nuclear fears to a boil. Hillary Clinton sought unsuccessfully to persuade voters to keep Trump from the Oval Office, in part, to keep his apparently volatile temperament away from the nuclear-launch codes. Now that Trump is about to take the helm, those worries will swell — not just among the experts but probably in the populace at large. Trump appears open to a cozier relationship with Russian President Vladimir Putin. But it remains to be seen whether his approach will do anything to lessen the risks of conflict with a Russia that is dead set on using its military with growing brashness to defend its interests. Even if a nuclear mistake is unlikely to happen in any given year, over decades the odds grow for it to happen at least once, the critics argue. What’s more, they argue, even if the chances are low, the harm is intolerably high, so if the risk can be reduced without diminishing deterrence by taking certain steps, why not take them? “One false alarm in a century is one too many, because the consequences could be catastrophic, could be civilization-ending,” says Bruce Blair, a former U.S. intercontinental missile launch control officer who is now a researcher at Princeton University. The risks of nuclear war are rising mostly, but not only, because Putin has deployed his country’s military, including its nuclear forces, with increasing aggression. America and its allies are responding. And so the cycle continues. Russia’s pattern of muscle-flexing is visible across the globe — from its proxy invasion of Ukraine to its buildup of forces in Syria. Russian aircraft and ships are buzzing U.S. and NATO counterparts virtually every day somewhere around the world, U.S. officials say. The Russians recently moved nuclear-capable missiles near Poland and Lithuania. They have repeatedly conducted exercises involving nuclear forces, and America has too. They have broken the 1987 treaty on Intermediate Range Nuclear Forces by developing a new nuclear ground-launched cruise missile. They tauntingly sailed an aircraft carrier battle group through the English Channel last month. Russian media reported the nation conducts civil defense drills each October, the most recent of which was said to involve 40 million people. Both Russia and the United States are engaging in cyberespionage and sometimes cyberattacks, some of which could trigger physical outcomes — such as electrical outages — that in turn could be considered an act of war, some experts worry. Russian military doctrine has blurred the line between conventional and nuclear war. It calls for using nuclear weapons as a means to essentially frighten an adversary into backing down from a conventional fight. It is not hard to imagine U.S. and Russian aircraft clashing, if only by accident, in the crowded skies over Syria — if not in the Baltics, the Arctic, the North Sea, the Aleutians or elsewhere. All this may be Russia blustering and posturing in ways it sees as serving its interests. But it has already led to a pattern of escalation between nuclear Russia and nuclear America. For example, Russian actions in Ukraine were a response to NATO expansion, and those actions led the U.S. to “reassure” allies by deploying to the Black Sea warships with Tomahawk missiles that could put Russian command-and-control, air-defense and early-warning facilities at risk, says Princeton’s Blair. Moscow in turn deployed attack submarines to the Black Sea to shadow U.S. ships, he says. Then American forces replied by sending P-8 sub-hunting planes. Moscow is not the only nuclear worry for Washington, D.C. The naval and air forces of America and China, another nuclear power, are on the front lines of a dispute over China’s contested claims of sovereignty in the South China Sea. North Korea, meanwhile, steadily nears the capacity to one day — perhaps in Trump’s first term — threaten U.S. territory with missiles carrying nuclear warheads. Iran’s nuclear ambitions are bound for now by an internationally monitored agreement. Nuclear Israel stands ready to respond if Iran breaks out. There also is the problem of nuclear and radiological materials unsecured and sometimes traded on the black market. Enough highly enriched uranium and plutonium to build tens of thousands of nuclear bombs is spread across 24 countries, according to the Nuclear Threat Initiative, a group that monitors proliferation. South Asia’s nuclear powers, India and Pakistan, are not threats to the United States, but as the only two atomic nations to regularly have gone to war with one another, their atomic rivalry poses a risk to the planet. A larger U.S.-Russian war would have worse consequences. Trump may want to threaten or even use military force in the early days of his administration to demonstrate his toughness to potential adversaries. It’s not known how he would respond in a high-pressure situation involving the possible use of nuclear weapons. Prompted by the prospect of a Trump presidency and rising tensions worldwide, arms-control groups have resurrected longstanding proposals to reduce the risks of nuclear war. These advocates are hopeful that a new president and Congress will be more open to some of these changes. But they know they face an uphill climb. One of their primary goals is getting rid of the procedures that require U.S. military forces to be ready — within 12 minutes of perceiving the U.S. is under attack — to launch some 600-plus nuclear warheads should the president decide to do so, and to unleash them within about five minutes of getting the order. Russia has a similar launch-on-warning posture. Because American ground-based missiles and command-and-control facilities are most vulnerable, there is a particularly strong imperative to “use or lose” them if a country thinks an enemy attack is en route, critics say. The worry is that the tight timeline and the vulnerability of ground systems would add to the pressure in a crisis, and a president might choose to fire the weapons on mistaken warning of an enemy attack. U.S. forces have mistakenly thought they were under attack before. In 1979 it was a training tape that was mistaken as a real attack. In 1980, a failed computer chip was to blame. These alarms were revealed as false in time. But if electronic communications were compromised or human beings didn’t act wisely, things might have gone worse, critics say. The Russians have also had several near-misses where they mistook innocuous events as nuclear assaults and, thankfully, were able to recognize it in time. Cyberattacks could potentially disable or overtake nuclear-command systems or early-warning radars and networks. A strike on a surveillance or missile-tracking satellite could leave leaders operating at least partially in the dark. Missile defenses could diminish a nation’s deterrent. Increasingly long-range weapons such as conventional cruise missiles could take out nuclear-command facilities or silos without crossing the threshold of using atomic weapons. A better system would build in some delays, the critics argue. That could be accomplished, for example, by eliminating the requirement for prompt launch or mandating a one-day waiting period or decoupling the warheads from the missiles, as many other nuclear nations do. Conservatives argue that de-alerting nuclear missiles could actually result in heightening tensions. Once the missiles have been taken off alert, any move to put them back on alert could be perceived as escalating a crisis, they say. Supporters of de-alerting respond that there would be no need to re-alert, because enough firepower exists on subs to obviate the need for doing so. 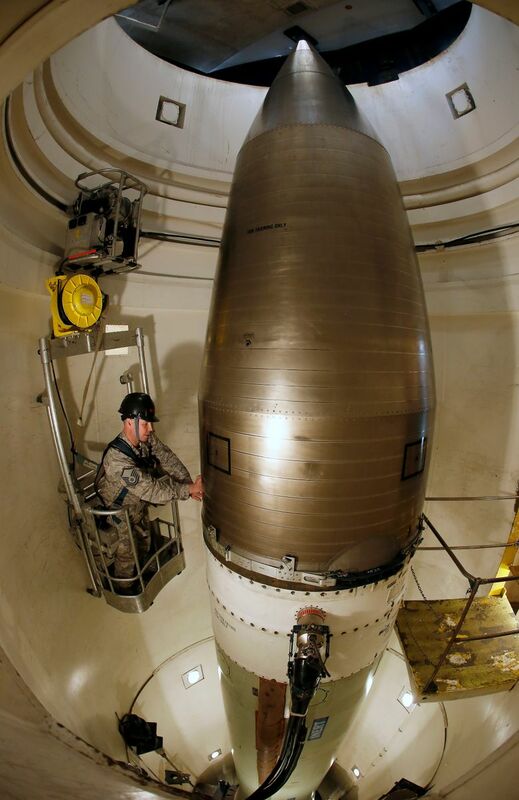 Many critics are up front about their view that ground-based nuclear missiles need to go because, they contend, these weapons’ use-or-lose quality creates incentive to launch them in a first strike. The man Trump has chosen for his defense secretary, retired Marine Corps Gen. James Mattis, asked a Senate committee last year whether this change might be needed. “Is it time to reduce the triad to a diad, removing the land-based missiles? This would reduce the false alarm danger,” Mattis said. Hawks in Congress, especially those who represent states where parts of the U.S. nuclear arsenal is built, are loath to give up any part of the nuclear “triad” of subs, bombers and ground-based missiles. The prospect of a Trump presidency has also led many critics to begin questioning whether the commander in chief should have sole authority to wage nuclear war. After all, they say, a congressional declaration is required, in theory at least, to engage in conventional conflict. Two Democrats — Rep. Ted Lieu of California and Sen. Edward J. Markey of Massachusetts — have introduced legislation that would bar the president from launching a first-strike nuclear attack without a congressional declaration of war that expressly authorizes such an attack.